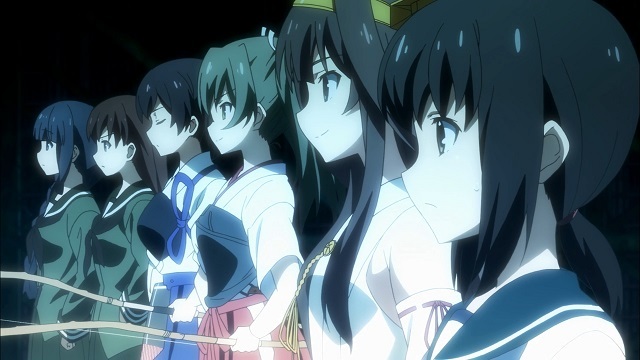 Fubuki has been assigned to a brand new fleet, Mobile Unit Five. 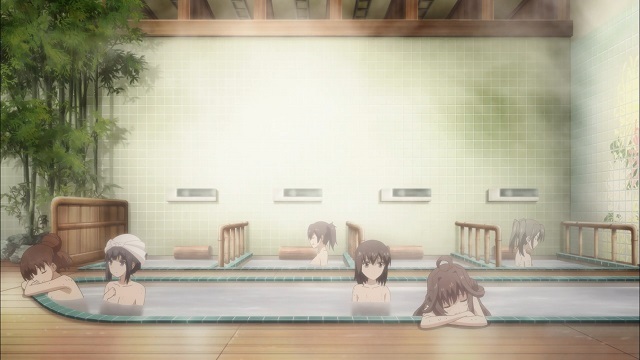 None of her friends will be joining her, as they've all been placed elsewhere as decreed by the Admiral. Nobody really knows what Mobile Unit Five is supposed to be, but we'll find out soon enough. 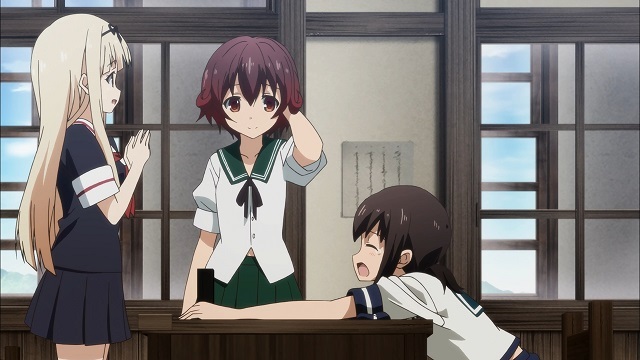 Meanwhile, Mutsuki knows they'll still be training together, so it's not like Torpedo Squadron Three will be forever gone or anything... tribute must be given, after all. 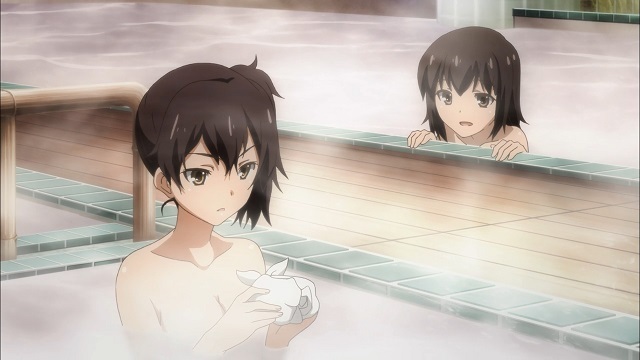 They go their separate ways, Fubuki wondering who her new teammates will be. She eventually finds the rooms for Mobile Unit Five and knocks on the first of the two doors. 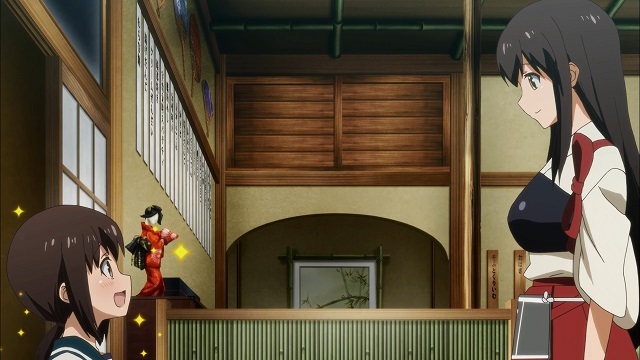 ...Kaga and Zuikaku are sniping at each other. This is historical, of course: the show even touches on it quickly. Kaga, the ship, was part of the Imperial Japanese Navy's Carrier Division One in WWII, along with Akagi. They were the biggest and most experienced carriers in the fleet, and were considered the elite. 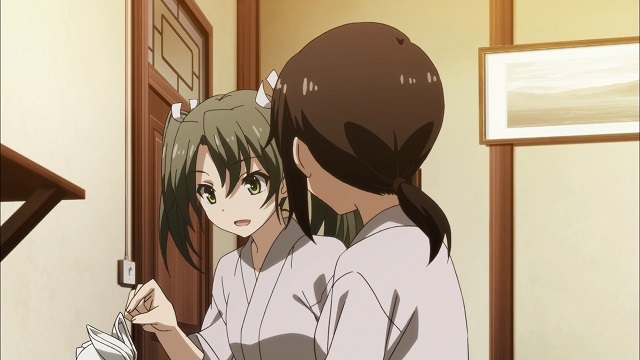 Sister ships Zuikaku and Shokaku, on the other hand, were brand new, coming on line just before Pearl Harbor. As such, they were thought of as the "Carrier Division Five scrubs." They were the rookies, and as a result, there was real-life rivalry between CarDiv1 and CarDiv5. As an example, after the Battle of the Coral Sea, it was thought that CarDiv5 had sunk two American carriers, though being mauled in the process. Instead of giving the two new carriers credit, the officers of CarDiv1 basically said "If they can do that, we're just going to slaughter the Americans." We all know how that worked out, of course. 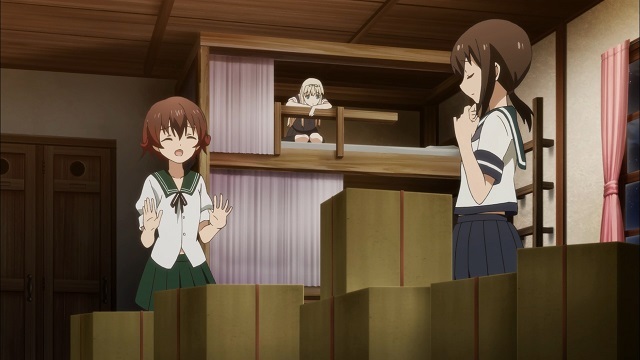 Anyway, the two fleet carriers are sniping at each other, and Fubuki can't take it, hiding in the hallway. Since there's six ships in a fleet, we're only missing one now. It's Kongo, and Fooby cries in relief. D'awwwwwwwww. 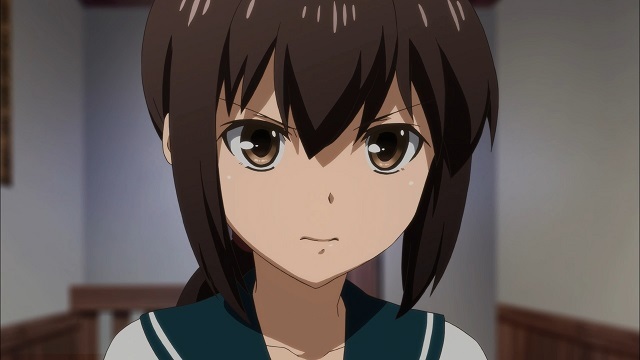 Getting away from the show for a second, and understanding that I don't play the game... what the hell sort of fleet is two heavy carriers, a battleship, two light cruisers and a destroyer? I know, I know: logic? 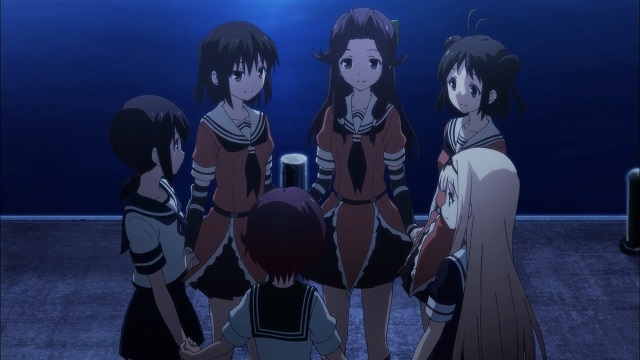 In my show about girls with the spirits of warships? But still, what the hell? 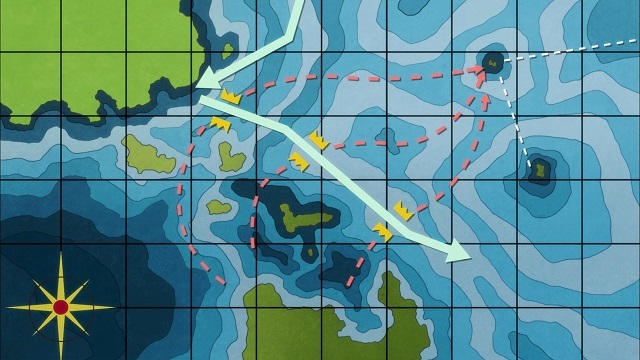 Every submarine captain in the Pacific is dancing a jig and fitting themselves for their Navy Cross right now. It's pretty evil in the room... they can't even agree on who's going to sleep where. 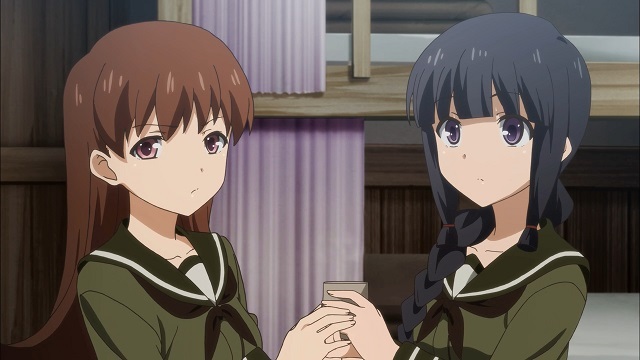 Oi is threatening to hurt anybody who suggests separating her from Kitakami, the two carriers refuse to be in the same room, and I'm rolling my eyes so hard I just sprained my medials rectus, and the others are about to go as well. It's not like this is a difficult puzzle: put one of the carriers in the same room as the cruisers, tah-frickin'-dah, everything is solved. But no, Oi has managed to piss me off to no end and I'm not enjoying this one bit. At least the two carriers are being clever in their snipings. 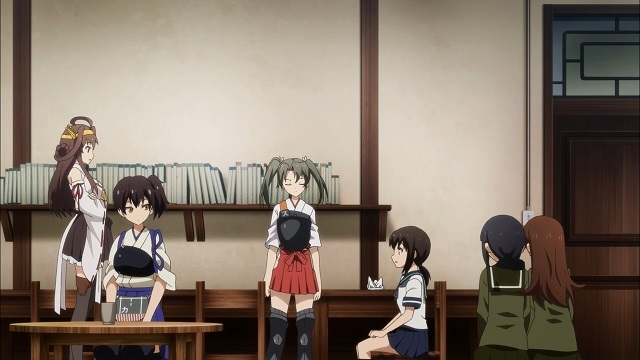 With nothing decided, Fubuki has to go to class. Merry is perfectly happy with her fleet; she's got cruisers who are perfectly happy to teach her whenever she needs help. 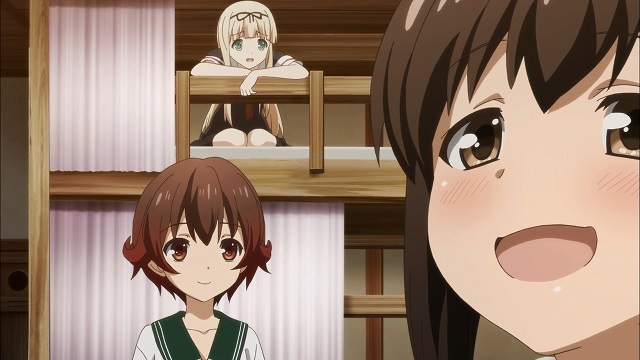 Pippin ended up with Naka-chan, the fleet idol from Torpedo Squadron Three, so she's perfectly happy as well. Everybody else is perfectly happy! Fubuki, crushed by her friend's happiness, slinks away to the cafe for some ice cream. Alone. Unloved. 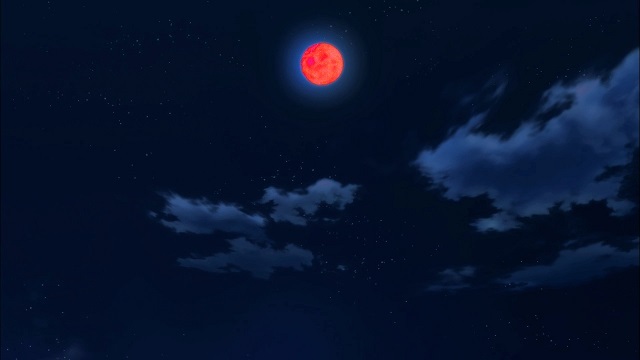 Except for Akagi, of course. I'd really like to know the science behind Frodo's sparklies. Are they like the sparks you get from a lighter? Does she emit bioluminescence akin to the light of a firefly? Are they even visible? Is she hallucinating them? 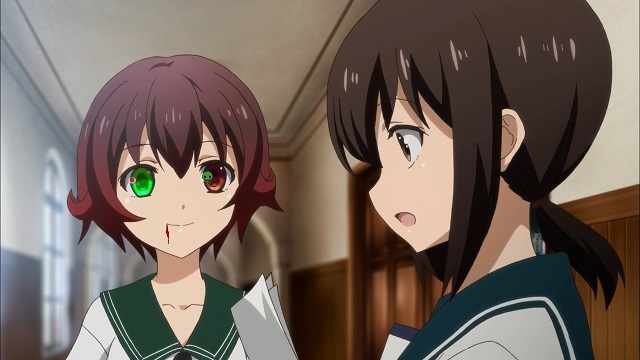 There's a thought... could all of this show be Fubuki's LSD dream? It would explain a lot. 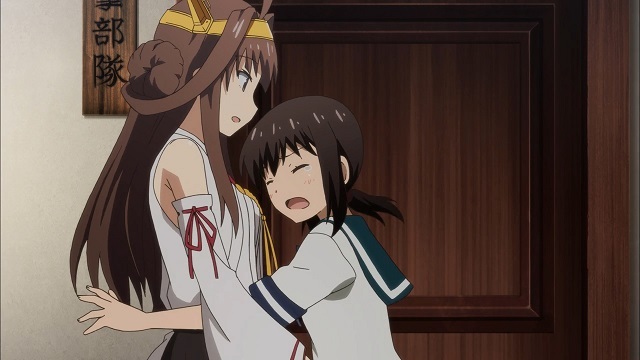 Soon enough, Our Heroine is spilling her guts to Akagi, her misgivings about the personalities involved in her fleet... and while the carrier agrees that it sounds bad, her faith in the Admiral is total. He wouldn't put a fleet like that together without a reason. Apparently "he's an idiot" isn't considered a reason. Anyway, she thinks it all has to do with Operation FS. 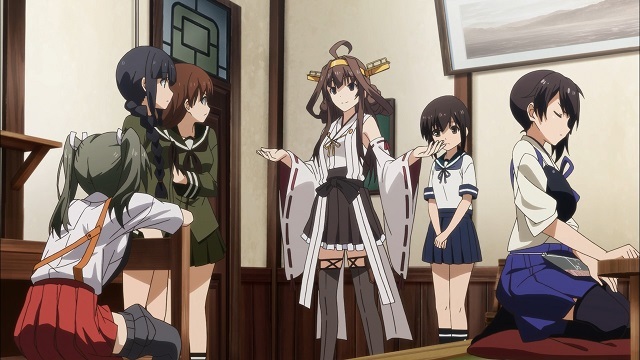 ...Foobie walks in on an argument over who's going to be the flagship of the fleet. Oh. I see how this is going to go. 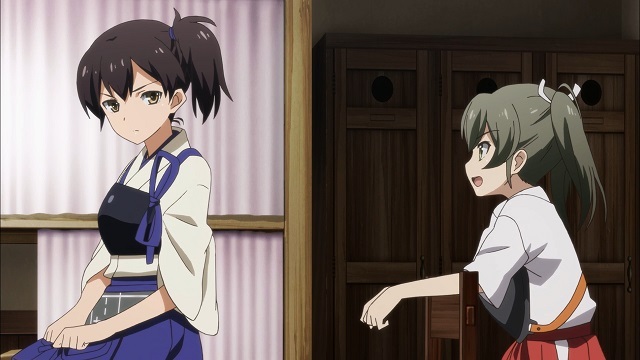 Kaga doesn't want to do it, but doesn't think Zuikaku can do it, either. 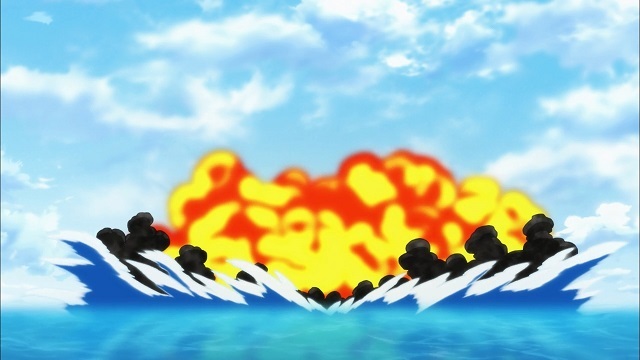 Nobody believes Kongo can do it without being distracted by something bright and sparkly, Kitakami doesn't want Oi to do it, because the flagship draws fire. And on and on and on we go until someone comes up with the idea of everybody trying the position once... the MVP gets the job. And we're off! Kongo takes the first try, all full of vigor, vim, vitality and punch. The rest of the fleet follows with varying amounts of enthusiasm. ...or some variant thereof. Everybody, that is, but Frodo. She's just a destroyer, right? Wrong, she's the Main Character. Of course she's going to get her chance, right? 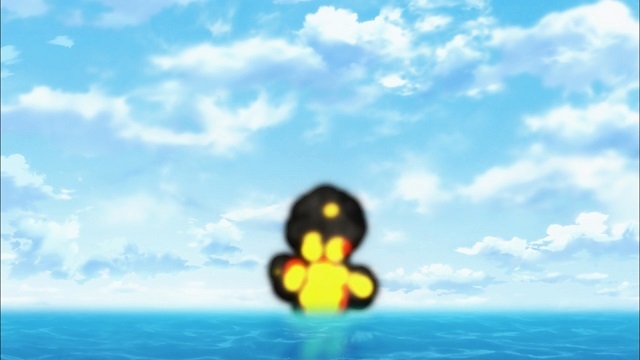 In the baths after one or another mission goes horribly wrong, Foobie discovers that Kaga can make towelbunnies. Since she and Akagi have to spend a lot of time in there because reasons, they've learned the esoteric art of towelbunnymaking. 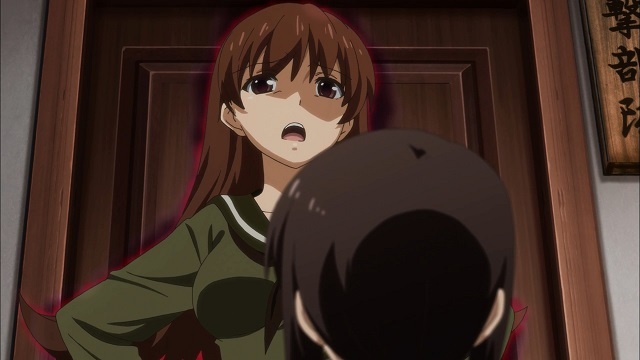 Kaga gives it to Our Heroine because this can't be a plot point, can it? Really, Production Staff? Towelbunnies? 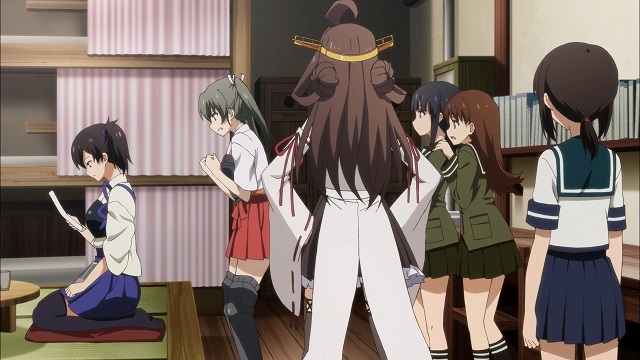 ...Zuikaku spies the towelbunny, thinks it's awfully durn cute, and asks Foobie to show her how to make it sometime. The carrier leaves, but Our Heroine realizes that she just missed the PLOT POINT, and rushes out after her. Out in the hallway, she makes an empassioned plea, ending up with an angry, aggressive look on her face, shown above. It works better if you play this video in the background. 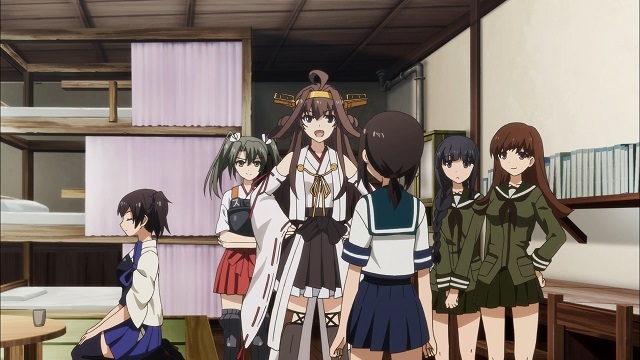 Just as Zuikaku prepares to hit Foobie on the nose with a rolled-up newspaper, the base sirens go off! 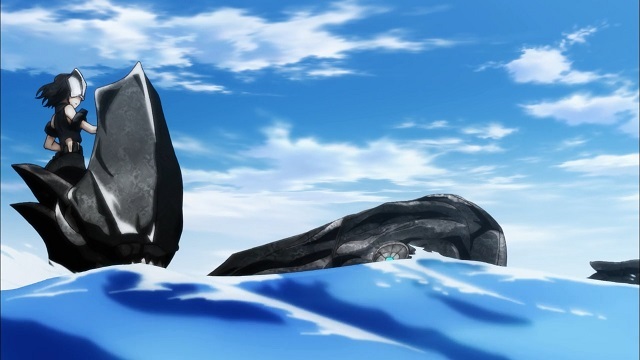 An Abyssal fleet led by a torpedo cruiser is approaching the base, and Mobile Unit Five is tasked with killing it dead. This'll be a cinch! Which is why everybody is half-assing it. 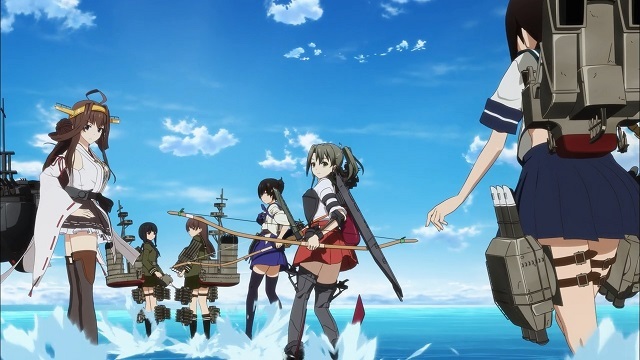 Oi and Kitakami just want to rush ahead willy-nilly, Zuikaku is all like "I'll come with," nobody has the first idea of tactics, and one of those clouds up there looks like a duck. I just thought I'd mention that. 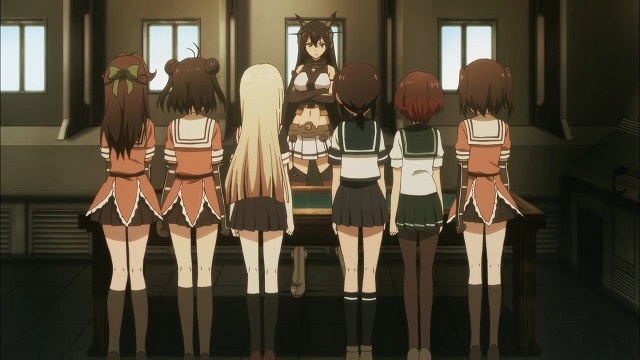 Of course, Fubuki calls on everybody to pull up their pants and act like a fleet. 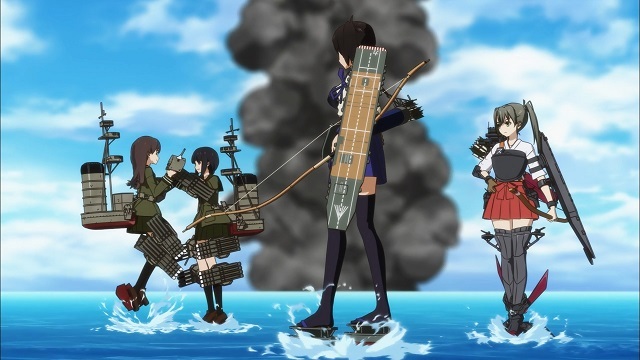 There's recon by aircraft, Fubuki leads the way like a destroyer should, Kongo pummels the lead ship, and the carriers just generally curbstomp everything the way a duck curbstomps a piece of rye bread. I'm not joking... the entire battle takes 54 seconds of screentime from spotting the enemy to the celebratory shot above. Huh. Looks like we've got ourselves a fleet or something here, huh? Wow. I never would have expected that. Who could have foretold such a twist? Oh yeah, anybody who has ever watched anime before, that's who. 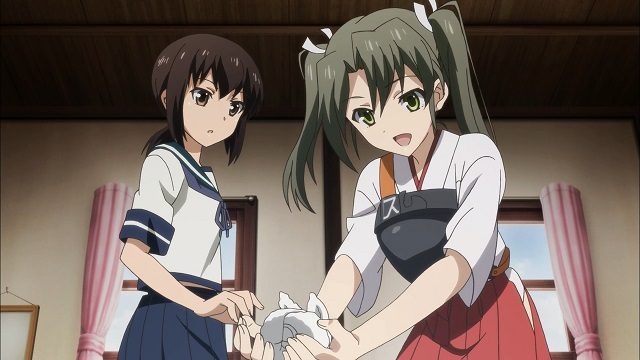 ...Zuikaku asks Frodo how to make the PLOTPOINT towelbunny. Frodo in her lovable, scamp-like way, says that Kaga made it, let's ask her! Hijinks ensue, fade to black, roll credits. When I started this particular writeup, I hated this episode. Now that I'm done with the writeup, my opinion has changed... now I'm merely "eh" towards it. Slice of Life with Gunfire. I'll never forgive the production staff for making towelbunny the most important part of the plot, though. I've gotta admit, though... it worked. Dammit, towelbunny is the episode MVP. Next week: more towelbunnies zombies! 42kb generated in CPU 0.1, elapsed 0.2594 seconds. 49 queries taking 0.2176 seconds, 256 records returned.